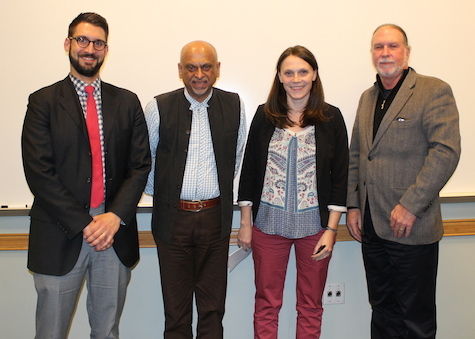 Silas Allard, Shekhar Hattangadi, Ellen Gough, and Edward Queen discussed Hattangadi's film, "Santhara: A Challenge to Indian Secularism?" Shekhar Hattangadi, a lawyer, journalist, and filmmaker from India made a short film focused on the Jain practice of santhara – abstaining from food and drink, leading to death by starvation. Jainism is an ancient Indian religion practiced by about 7 million people. Its golden rule is nonviolence. But its death ritual has drawn criticism for supporting death while Indian secular law upholds life. Practitioners say the act is about spiritual purification, achieving the highest state of being by cleansing the self of karma. Critics say it is a way of coercing elderly people to end their lives so they won’t be a burden on society. “Why is it that only those who are near death and terminally ill choose santhara?” a lawyer asks in the film. The film shows an elderly woman slowly dying from fasting, surrounded by Jains supporting her by chanting. The Rajhastani High Court ruled in 2015 that santhara should be considered suicide, and the state should abolish the practice and treat any death by santhara as a criminal case. The case was appealed to the Indian Supreme Court, which may not consider the matter for several years. “The Supreme Court will distinguish between a legitimate religious practice and a custom that persecutes the elderly,” Hattangati said, adding that the case will become a footnote in law and religion case law in India. She added that Jains are opposed to suicide.